The Government has preparing a budget of Rp 313 trillion to develop infrastructures all around Indonesia. Therefore, the Government sets the target to build 1,000 km of toll roads in 5 years. “There are only 800 km of toll roads which have been built since the independence of Indonesia. Within the next five years, the Government will build at least 1,000 km of toll roads,” President Joko “Jokowi” Widodo said when delivering a remarks at the 20th Congress of the Indonesian Engineers’ Association (PII) of 2015, held at Sari Pan Pacific Hotel, Jakarta, on Saturday (12/12). To meet the target, President Jokowi asserted that he does not hesitate to directly observe and check it. Moreover, land acquisition in several constructed toll roads has not 100 percent finish yet. “We do not hesitate, this is for the sake of the public,” the President said. President Jokowi believes if he directly observe the location once every three months, then the related ministers will observe it once a month. Certainly, the lower-ranking apparatus will observe it more frequently. “I said to the Ministers not to take a decision after three or more meetings. I do not want to waste time,” the President said. 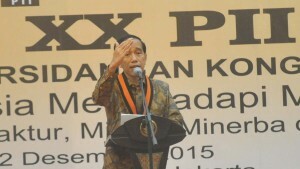 President Jokowi admitted that many people from the regions questioned the upcoming infrastructures development. It was experienced by President Jokowi when he started the development of railways in Sumatra. “Is it really being constructed Pak? Because we do not want the Government only conducted groundbreakings without really constructing the road. The road has not finished for 30 years,” President Jokowi said while quoting the questions of the Sumatran. According to the President, he has some requirements to conduct a groundbreaking of an infrastructure development. For example, the railways must have been constructed for 7 km. “I will come if the railways have been constructed for 7 km. If Pak Aburizal Bakrie does not believe it, I have the pictures,” President Jokowi said while pointing the picture of himself when walked through the railways. The statement of President Jokowi made Aburizal Bakrie, who attended the event as the former Chairman of Indonesian Engineers’ Association (PII), as well as other congress participants laugh. President Jokowi also mentioned the matter of power plant. According to the President, he has instructed the related ministers to cut the permits process, because it takes 2 years or even 6 years to work on the permits. There are 69 permits. If it is needed we will cut into one-third. I calculated there are 269 sheets,” the President said.